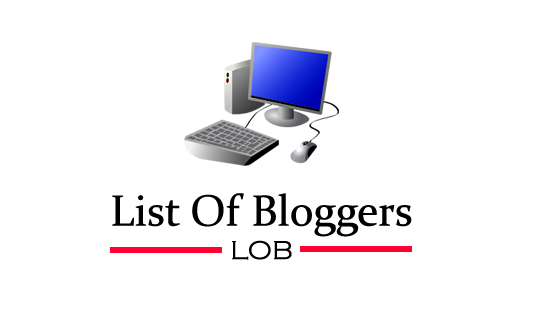 Welcome to List Of Bloggers(LOB). This is M.Nirmal Anandh from Madurai, Tamilnadu. I am the Founder of this Blog. I started this blog especially to ease the way of searching bloggers/blogs through search engines. It's a single spot destination to get the bio of bloggers and their blogs with their social media links. By this, anyone can get the detail about a blogger and their social media pages. List Of Bloggers is simply called as LOB. Here you can find all kind of bloggers blogs about Making Money from Online, Search Engine Optimization, Blogging, Tutorials, Gadgets, Technology, Fashion, News, Current Affairs, Politics, Cinema, Entertainment, Fun, Education, Arts etc. Also you can find info about List of Indian Bloggers, List of Female Bloggers, List of Foreign Bloggers, List of Fashion Bloggers, List of Gadget Bloggers, List of Tech Bloggers, List of Beauty Bloggers and List of Cook Bloggers . Other than LOB, i am having two blogs classiblogger & indianmagz. In classiblogger, you can find information about Blogging Tips, Make Money Tips, Technology and Uni Updates. IndianMagz is a Multi Niche site, there you can get interesting informations about Latest News, Cinema Updates, Gadget Updates, Entertainment, Education, Jobs, Fun etc. By adding your website/blog to LOB, you can get free traffic to your blog. To add your blog, you can just Click Here.